Stone - What type or color stone was used? No, I didn't find out information about the Stone. What are dimensions of door and windows? 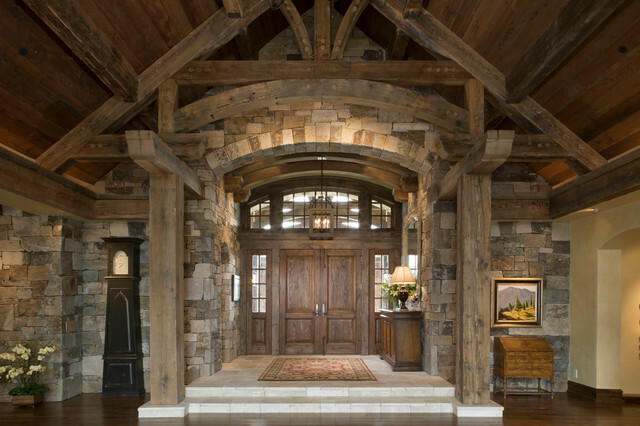 What color of stain was used on the beams? Stone - What type of stone is this? What brand is this chandelier? Thank you. Dimensions of door - Can you give the overall dimensions of the door and wondows? Thank you. Beautiful. Where ca I get that door? It's beautiful! What is the chandelier in the front entryway? What is the stone? - What is the name of the stone?